Designed by Andrea Chiarvesio and Luca Iennaco, Kingsburg is a briskly paced game for 2-5 players. Players adopt the role of a governor, and vie for resources to build up their province, military power to defend their homes, and above all the influence of the King. Over five years (five turns) players rely on various advisors to the King for resources. From tangibles like gold, wood, and stone to soldiers and portents, each acquisition will shape the future of your community. I’ve been playing this game a bit recently both on the board and with their app and have come pretty accustomed to its game play. The game is pretty solid, but I’m not overly impressed. Let me dive in and explain a few things to offer my opinion. The idea of the game is that you are a governor proving your worth to the king as you build up your territory and collect points by doing so. The game is broken up into season where you are collection your resources to build and then actually getting down to the business of building your land. At the end of the year in winter you are attacked and have to defend your lands from the enemy. Doing so will reap you a reward, but failure will destroy you almost. This is especially true later in the game. The game mechanic is a worker placement with the use of die as your workers. You have three die that you use to collection the resources you need. The board is made up of different advisors you can place on to collect the resources you need. Generally, the higher your roll, the better resources you can collect. (Check out the tips section because its not completely true, there are ways around low rolls.) When placing your die you can use all three of your die to gain an high total or break them up however you see fit to collect your resources. This is a mechanic that I like with the options and risk verses reward. After a season of collecting resources you have an opportunity to build. Each building adds something extra to your land. It could be more defense against the oncoming horde or a resource benefit. This rotation of collecting and building happens twice before the attack comes, so make sure you are ready for that as well! •	The artwork is really nice as expected from a Fantasy Flight game. •	Game play and entertain most gamers as well as new gamers. And the art for the game will draw them in as well. •	I enjoy a game with a little bit of luck that can be worked and strategized with and this game offers that with the roll of the die. A bad roll can hurt you, but it won’t destroy you. Its manageable. •	I like that the battle aspect and destroy your whole game if you are not careful. I guess it has some pros and cons itself. I like that it is a real risk, it will hurt you, especially later in the game as they become more difficult. But at the same time it drives you toward one certain strategy. •	There is not much interaction between players. It is almost a solitaire game. •	It could be that I am not stretching my game play ability far enough, but there is not much strategy. Whereas some games offer a number of ways to play or gain the victory, I have found one main way that works greatly. As I said above, I’m not overly impressed with the game. It’s not one that I would veto if someone wanted to play it, but it’s not something that I would beg for either or want to play over and over again. If there expansion brought more interaction then that may change that some. Personally, I already own a few worker placement games so I would not want to add this to my collection. As for the App: It was an app I bought before I played the board game. Some have had problems getting it to load or play but it has worked just fine for me. It is a little clunky, but its not a bad app. If you enjoy the game I would suggest it, but I had the hardest time learning how to play the game from the app only. It wasn’t until I played the game that it made any since. While dice are heavily used in this game, this is not your typical dice game. Each player is governor of a realm of the kingdom, each trying to build the the better castle. The game is divided into 5 years, with 4 seasons each year. During three of the seasons the players are able to gain resources and build on their castle; during winter each player is attacked by a monster which can either harm the player or give the player a reward, depending on failure or success. During each productive season all the players simultaneously roll their dice, then progressing from the lowest total to the highest each player may spend their dice to gain resources. There are 18 advisors on the board numbered 1-18 and the dice are used to determine which advisors you can use. For instance,f you rolled a 3-4-5 then you could use advisors 3, 4, and 5, or 7 and 5, or 3 and 9, or number 12. Once an advisor has been claimed for that season, no other player may use them. After gaining resources players may then spend them to build; each building offers a bonus to the player, and each player has the same choices. The buildings are arranged in a grid on a player mat, and you have to build left to right (columns) but you can pick which rows. Most buildings award victory points, although points are awarded for fighting off the monsters as well. The game has a fair amount of luck involved regarding what numbers show up on the dice, however deciding what to do with your dice is a large part of the strategy behind the game. It is light-to-medium as far as strategy is concerned, but it is far from a luck-determined game. Kingsburg is a pretty great worker placement game. Basically each turn all players roll three dice and then compete to place these dice to influence the king’s advisers (numbered 1-18). The catch is that each adviser can only be influenced once per turn so choosing an adviser to influence depends heavily on what the players ahead of you have rolled as well. Different advisers give you different amounts of resources, attack strength, or victory points. There are modifiers and catch up mechanisms in between each season of the game and at the end of the year each player must have enough fight strength to combat a monster, which will get stronger and stronger throughout each of the games five years. Resources are used to buy different buildings, which all come with their own special abilities and earn the player victory points. The winner is the player with the most points at the end of five years. The heavy use of dice might scare some people off don’t like too much luck involved in a board game, but Kingsburg actually handles this pretty well. Even rolls with low totals can end up getting a couple resources on a turn. The only rolls that are really terrible are rolls where all three dice are the same (1,1,1; 2,2,2; etc.) because they severely reduce your adviser options. The only real issue with the base game of Kingsburg is that after a couple games you’ll likely realize that there are only one or two good strategies, so the game can get stale pretty quickly. I find that when I play with my friends who have played quite a bit we all end up with nearly identical build patterns by the end of the game. However, the expansion “To Forge a Realm” addresses this issue and adds much more variety, extending the lifetime and fun you’ll get out of Kingsburg. Overall I would definitely recommend Kingsburg, but be weary that you’re definitely going to want to pick up the excellent expansion at some point. Kingsburg was one of the first games I tried in which dice was used in a different way. An area Stefan Feld has somewhat specialized in over the last few years. Each player takes on the role of governor with a goal of helping the King build up his realm and prevent marauding enemies during winter. Most successful governor will of course be declared winner of the game. Kingsburg last for 5 years (aka rounds) with each year divided into spring, summer, autumn and winter. The first 3 are performed in the same way while winter brings an attack which needs to be repelled. Gameplay in Kingsburg is fairly straightforward, the King has 18 advisors including himself numbered 1-18 and at the start of spring, summer and autumn each player rolls their dice and in turn order, lowest total begins, each played may hire one advisor with a die or combination of dice which thus will prevent others from using that advisor that turn. After everyone has placed their dice you go through each advisors favor which often will be gaining resources like gold, wood and stone and finally everyone will have an opportunity to build with their available resources. 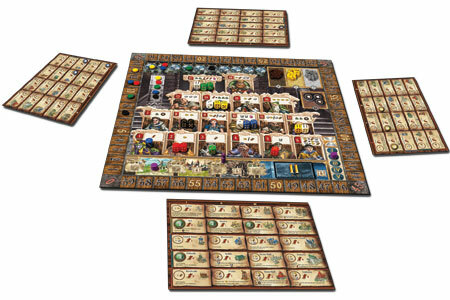 The expansion adds several features such as 2 rows on the player board as well as individual rows giving more variety to the game which it really needs. Event cards and characters are a nice random feature that adds a little flavor, but most important are the battle chits that allow each player to determine how much of the Kings Forces they need in the winter battle. Although the rules and gameplay is fairly simple, Kingsburg takes a while to finish, especially with 5 players. The expansion adds variety, but there still seems to be an obvious way to start building; inn, market and a battle improvement first year and then farms as early as possible in year two. Still, it’s a game I enjoy playing every once in a while but if played too often could result in a total burnout. Rating: 6,5 but an 8 with expansion. Basic Idea: You’re a vassal in a powerful kingdom trying your hardest to be the best darn vassal you can be. You build up your town, grease the right wheels and defend your people from attack, and by the end of 5 years, you see who’s left standing tall. Game Play: At the beginning of the game your given a sheet with a variety of buildings, three brightly colored dice and a resource of your choice (between wood, stone and gold). There are five “years” in the game and four “seasons” in that year. At the beginning of each season (except winter), all the players rolls their dice simultaneously and leave them where they lay. The player order is then arranged from lowest roller to highest. On your turn you use your dice to “gain favor” from the right person at court. On the board are wonderful illustrations for everyone at court from the lowly joker to the king himself. Each character gives you certain benefits such as resources, victory points and military power. You gain favor by placing your dice on a character with the corresponding number. For instance: if you rolled a four, a two and a three, you could place your dice on #9 (using all three dice) or #6 (using your four and two that you rolled) or #2 (just using the two). As long as no one’s taken that character already, you’re free to place your dice using any combo you have. You can only gain favor with one character until it’s your turn again. Everyone keeps going until they run out of dice combos to use and then everyone collects the favors they’ve earned. After you all finish sucking up to the powers that be, you build up your town. The price in resources for each building is listed on your sheet, as well as the bonuses and victory points you get from building it. They have to be built from left to right (you can’t build the Church before the Chapel) but can otherwise be whatever building you have the resources for. But when winter hits, you better have your military in order, because the monsters are about to attack (and they get worse every year. One die is rolled for all the players. You add that number to your military power and compare it against the monster. Winners take home glory (and some resources) where losers can lose not only their stuff but their buildings as well. After five years, the one with the most victory points (and the best die rolling skills) wins! In Kingsburg, the players are Lords in a kingdom, tasked with building prosperous lands that are self sustaining. This is accomplished by sending out workers (dice) to consult the King’s court of advisors where they’ll receive resources, aid and information which can be used to construct buildings. Those buildings will be used for prosperity and training as well as defense against winter invading monsters. Whoever, after 5 years, has pleased the king the most, wins. – Dice Rolling/Placement – Players simultaneously roll their color dice. These dice determine where you may place your workers, and in which order players will go, starting with the player who rolled the lowest. When placing the dice, you can place them in any combination on any advisor that does not already have another player on that advisor. Anyone familiar with Worker Placement will recognize this part of the mechanic. You’ll then continue in player order until everyone that can, has placed all of their dice. What sets this apart from most Worker Placement games is you do not immediately get the resources or advantage of that spot when you place your dice there. Instead, you go, from lowest to highest, grabbing resources. This allows you to set up some interesting combinations that can gain you an advantage to some of the lowest rolled numbers, where you’d maybe just normally just get a wood, you’ll now be able to trade that wood for a stone AND gold at the trader. – Buildings – You’ll need to collect resources so you can exchange them to build buildings which grant you a special ability or benefit as well as usually giving you some victory points. The abilities can include ways to manipulate your dice, give you extra dice, better ways to manage your resources, or give you defenses against the end-of-year invading monsters. This is where the majority of the game’s strategy comes through, as you try and figure out which combination of buildings you want. – Invading Enemies – The game takes place over 5 years, each consisting of 4 seasons. During the spring, summer and autumn seasons, you are allowed to build. But during winter, everyone must face an unknown foe. Each year. the difficulty of these enemies increases more and more, and players will gain rewards for defeating them, but risk losing resources, points or even buildings if they fail. But before facing the monsters, a player will roll a die which shows how many reinforcements the king is sending to all of the territories. This die, in combination with your building’s defense values and any other special benefit you gain from the advisors, determines the success or fail. Sometimes this will feel a bit like a “Push Your Luck” type mechanic. This is a pretty straightforward game. I’ve taught it to several players who are new to board games. And it provides enough fun as a gateway game for people new to board games, but enough to think about for experienced gamers too. It isn’t too thinky, but it can be bogged down a little bit by going over the choices you have on advisors. Since the higher rolls tend to yield better results, there can be a lot of perceived advantages to those that are lucky in their rolls, but players who win are usually those that can best use their resources, not those that gain the most. So there may be some imbalance with the luck of the rolls, players who lose will more often lose because of their own mistakes, and not because they didn’t get a break. Still, not getting good rolls can be very frustrating. The basic premise of the theme is very vanilla. It’s a medieval fantasy setting. Not a lot of thematic flavor really comes out on this one. How the theme blends with the game mechanically is sufficient. I assume the dice represent a worker’s persuasive talent, which allows them to seek aid from those higher on the king’s court, even up to the Queen and King themselves. There are some +2 tokens, which have no thematic explanation, but I’ve always perceived them as being a sort of “favor” granted by the court, which you can always cash in later. I can’t say the mechanics really flesh out the theme, but they ultimately don’t detract from it either. I wouldn’t present this to any player as a “Thematic experience”. In fact, it is probably one of Fantasy Flight’s most euro-style games that they continue to publish. – Main Board – The main board is well laid out. Everything is very clear, everything is language independent. The only thing is that there are some instances where players “tie” for a special benefit, and the board doesn’t really clarify what you should do. So you’ll have to consult the manual if you can’t remember. But the graphic design is clear enough that it doesn’t’ really barricade new players. – Dice – The Dice are incredibly average. They are indented, painted dice with rounded corners. So they aren’t made for rolling across the table like casino dice, but just shaking in your hand and placing them down. – Cards – There aren’t many cards in the game, but they are included. They have a good quality to them. They have a black edged border and you’ll only shuffle them a little bit when setting up the game, so they won’t scuff too much. But if they do scuff and start showing wear, it can be a huge advantage to players who recognize the markings. If this happens, you’ll want to sleeve the cards with an opaque back. – Chits – There aren’t too many types of chits. There are a handful for each player and some +2 tokens. All are great quality though. Fantasy Flight has a bit of a reputation for their punch board components. – Wooden Pieces – There are some uninspiring but incredibly practical wooden cubes, a handful of wooden discs, and a little wood piece that is suppose to represent the King’s Envoy. Not too detailed, but sufficient. No real complaints about the quality or application of them. – Insert – The insert is a molded plastic extrusion. It’s functional, but it doesn’t store the components in any organized manner. It’s a bit oversized for what it actually holds. Overall, I like that it is plastic, but it’s still just a very generic insert. – Rulebook – Fantasy Flight has a reputation and knack for unorganized and convoluted rulebooks that are very hard to reference. A lot of their games are quite complex monsters, but even some of their other, smaller or gateway games have these problems too. Kingsburg is the exception. It’s a very concise rulebook that is very easy to learn and reference. The art has a good style but it’s hard to really feel it is original, mostly setback because of the theme. Without really taking a risky stylistic approach to the art, there’s just not a lot left to do to make a high fantasy theme feel fresh and unique. I’d like to say that the game presents a lot of random elements that really brings a lot of replay ability, but in my experiences, players seem to really settle into a set strategy. After a while, the game always seems to feel very similar. I’ve seen a lot of Inn>Market>Farm>Merchant’s Guild strategy so that players get flexibility with how the place their dice. Until I really started experimenting outside of this, I was getting quite bored with Kingsburg, but there are only so many build orders you can have in Kingsburg. I would love to say there is a lot of replayability, but I find so many games just end up going down a similar path. There is replayability, but it takes a player that is willing to really try something different, sometimes at the risk of being competitive. This really should have a pretty broad appeal for gamers. If you’re an avid gamer, you should consider having this in your collection for those that aren’t is in to games as you are. It provides enough game to be enjoyable with an occasional play, it’s light enough for new or casual gamers or family members to take some time and play. The game is very much a light-to-medium Euro game, but it isn’t soulless. There will be a subset of gamers who will feel like they’ve moved on beyond what games like Kingsburg provide. Those that are looking for a very in-depth and strategic game should keep looking past Kingsburg. Those that are also looking for a wild theme park ride or thematic experience should also consider passing on this. It doesn’t provide a rich, thematic experience. The game doesn’t have a lot of direct interaction. You’re mostly just trying to get in the way of other players and cause them an inconvenience. Kingsburg is a decent game. It’s a game that will stay in my collection. But it won’t get played frequently. The game is a good, light introduction to some more complex mechanical concepts used in other games. It has a good place role for dice and it has enough of a challenge to keep me engage for an occasional game. Just because dice rolling is a core mechanic does NOT mean the game is only about luck. In fact, the board is designed in a way that small rolls often can yield much more needed results than large rolls. The basic premise of the game is that in each production phase (summer, spring, autumn) each player rolls three dice. They may then place these dice on the numbers 1 through 18 to acquire certain resources to help them build buildings for certain advantages such as increased military power or more affordable buildings. When winter comes, the players must defend themselves against the barbarian hordes. By splitting up the numbers, placing one die on each space, the “luck” factor of rolling high can be negated as a player can still receive multiple goods even on a low die roll. The game plays smoothly and is easy to learn, and the pieces are of above average quality. This is another good game to introduce new gamers to. With a simple worker placement mechanic and a fun board and components this is a great way to hook ’em on gaming. The expansion really adds a lot to the game, helping it to stay varied and fresh. It’s always fun to roll a bunch of dice and Kingsburg gives you that chance. The mechanics allow for your decisions to combat the fate dictated by the die rolls, but in the end luck does play a big part in this game. I do prefer it with some of the expansion items added in. Great game but the expansion makes it fantastic! This game is jam packed with dice rolling, but luck is mitigated by splitting up those dice to get several small rewards, or using them all to take a more powerful space. It’s quick paced, and easy for new players to learn. I will play this game every time someone brings it out. Great start or end game for game night. Easy to teach and play! A turn in Kingsburg consists of the following: Roll a bunch of dice, look at the dozen or so different ways they can be combined, look at the resources you can get from those different combinations, try to figure out which of the buildings you can get with those resources you want or which is a prerequisite for a building you want, puzzle over everyone else’s rolls to figure out which of the actions you want to take they can steal, prioritize your moves based on what’s likely to get taken, make your first move, then start from scratch when your second move gets taken anyway. Eventually there are some monsters. and picking resources for buildings… it is easy to learn but hard to master. the replay value is high because it will change every game you play. The theme itself might be getting a bit old (influence people in a medieval setting, build your empire, fight off monsters, etc) but I have to love the game mechanics. Instead of a city or workshop, the main board is literally the assembled royal advisers, huddled around the king, ready to run the kingdom. The dice mechanics make the results a bit random, but it’s a great game for people who want something relatively quick and light, but are getting bored of games like Ticket to Ride and Stone Age. After only playing this once, my friends and I agreed we didn’t see what was so special about this game. Whether it was the mediocre worker placement mechanic or the roll of years that seemed to be rather arbitrary, we just couldn’t get in to it. We followed the rules and understood how the dice system worked. Maybe it was the lack of direct conflict or it was the difficulty in utilizing all of the worker placement options. Everything just felt “meh” about this game. As someone who is prepared to reserve space on the game bookcase only for those games which are truly worthy of my time, I ended up selling it. This game I am entirely new to, only played 4-5 times, but I do like it. It was simple to learn, and although there seems to be a lot of components involved, the turns have a repeat pattern, which makes it simple to get into the swing of things. 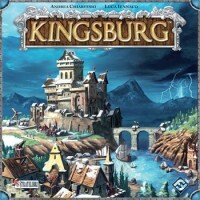 Add a Review for "Kingsburg"